This is an original, laser cut kit of furniture for your Bespaq Dutch Baby House. 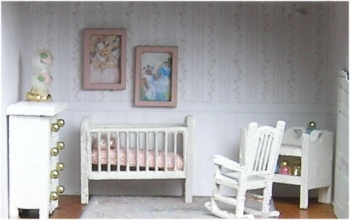 Included are the Crib, Changing Table, Chest of Drawers, and Rocking Chair. Kit is easy to assemble and can be painted as shown or stained. Accessories such as lamps, artwork, rug, etc are NOT included in the kit.